October is almost here, and that means it’s time for the Air Force Academy’s Falcons to square off against the Naval Academy’s Midshipmen. It also means that it’s time for the usual inter-service rivalry to flare up, and Annapolis has delivered a doozy. Naval Academy cadet Rylan Tuohy has directed a video called “Air Force Training at Navy,” which was posted on YouTube Sunday. The mock training film purports to take a “recently declassified” look inside the Air Force Transition to Navy Environment program. 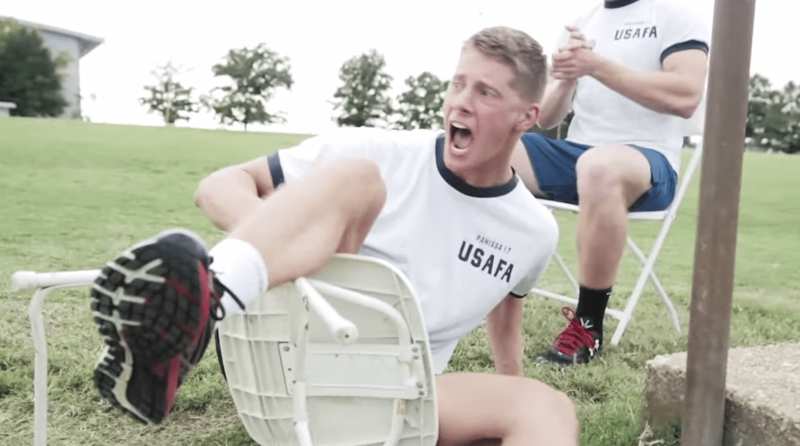 But in a riff on the “Chair Force” stereotype, the supposed Air Force cadets prove to be incapable of running, marching, doing situps or even swimming without their beloved chairs strapped to them. OK, Falcons, you’ve been called out. You guys gonna put up with this? If anyone in Colorado Springs has a video to answer this one, send it our way and we’ll put it up. The Air Force plays Navy this Saturday in Annapolis. Kickoff is at 3:30 p.m Eastern, and it will be broadcast on the CBS Sports Network.